High moisture levels in soils and around pots encourage the development of fungus gnats, shore flies and other pests. Fungus gnats will feed on fungi and decaying organic material in the soil. If a fungal food source is not readily available, fungus gnats may feed directly on plants. During the propagation of cuttings, fungus gnats may feed upon the callus. This may slow down or completely inhibit rooting. They can also damage the roots as they feed upon seedlings and potted plants. On many thick and succulent stemmed plants, larvae may tunnel into stems and cause plants to wilt and die. Larval feeding upon young roots encourages the development of root and stem rots such as Pythium. When this occurs, plants will be stunted with reduced growth and leaf drop. Shore flies feed upon algae and do not directly feed upon plants. However, their frass (droppings) on plants, in addition to their presence, may be objectionable to customers and may carry other diseases. 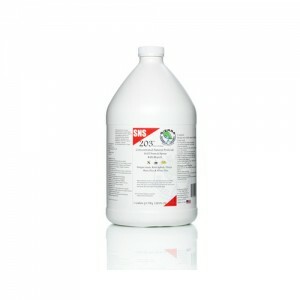 SNS-203™ Concentrated Natural Pesticide Soil Drench active ingredients, attack fungus and algae and cause the pests to dehydrate their body fluids and dry up. 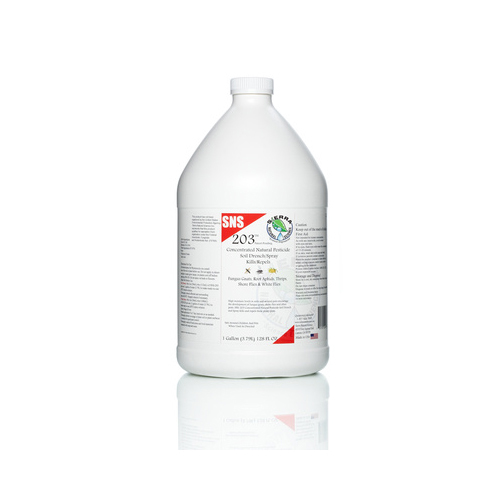 When used as a foliage spray SNS-203™ will control and eliminate Greenhouse Thrips, Fungus Gnats, Root Aphids, White Flies and Shore Flies. Our Product has been tested in our lab on delicate new growth, clones, cuttings, tomatoes, roses and other plants.